Why are my results not listed here? PR, SR, NT, NH, ND, SCR, DQ, etc. Why are some Athletes crossed out? Why are some results gray? Athletic.net works a little differently from other statistics sites. Each team is responsible for posting their own results. So, it depends on the coaches for when/if their results get posted and/or corrected if necessary. As more and more teams use Athletic.net the results become more complete. Let your team's coach know about the website. Most features are free and it makes a lot of coaching chores easier (there are over 40,000 coaches actively using Athletic.net right now). Be sure to thank your coaches for posting results too! If your coaches aren't already on Athletic.net, please encourage them to sign up for a FREE coach account. When you upload complete results for any meets you attend or meets occurring in your surrounding area, there is a huge impact! All team reports, athlete bios, TFX rankings, and any custom performance lists will automatically be updated with the new stats. Follow the simple steps below and join thousands of coaches around the nation in providing results, stats, and rankings for everyone to use! 1) Sign In to your coach account. If you are brand new, click the link shown in the image below to create a free coach account. 2) Go to your Team Page by clicking on the Coach Tools button and selecting the team you are associated with. 3) On your Calendar, click the Add a Meet button. Follow the steps as it takes you to your state's master calendar list. If the meet already exists, click it and add it to your team. If no one else has listed the meet on Athletic.net, yet, you can do that. 4) Back on your Team Page, click on the meet title to expand the options and click Upload Results. 5) Upload Results by either selecting a file saved on your computer or pasting in the complete set of results to the upload page. On the results upload page there is a 'Need Help' button that will guide you through what result formats you can use. 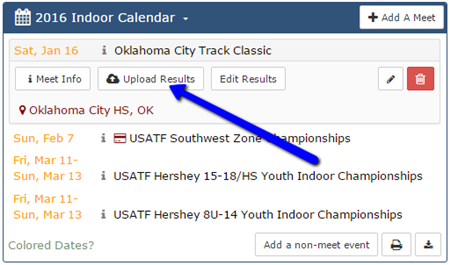 Athletic.net Admin will then come through to verify that you have correctly matched up teams and athletes and then re-post the results if any new teams and athletes needed to be added to the meet to get Official Results published.